July 2019 only for rent! A collaboration by BILDEN & DISC Interiors. Here is an opportunity to live in one of most special livable architectural houses built in the 21st Century centrally located in the Santa Monica Canyon. 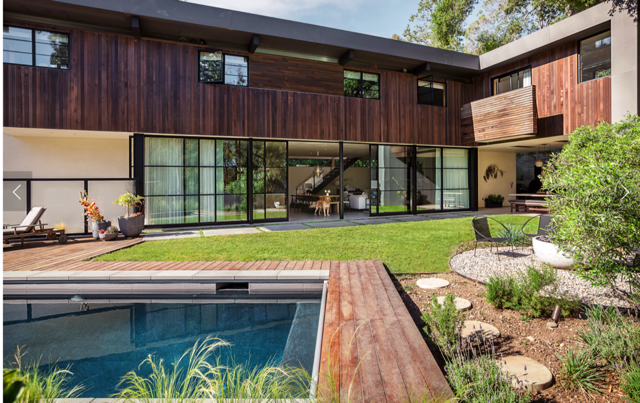 Tucked under several majestic oaks, this house is designed to maximize the light, view and warmth by pushing the structure to the back and one side of the irregular lot. The lower level is conceived as an open, loft-like space containing the kitchen, dining and living areas between the blocks of the garage and the guest suite and private garden at the back. Floor-to-ceiling sliding glass and steel doors open up this room to a front yard containing a pool, hot tub, firepit and grass area for day-to-day and entertaining enjoyment. There's also an outdoor dining/living area under the master bedroom wing that reveals the board-formed concrete retaining walls and the oaks of the 'backyard'. Upstairs the bedrooms, office and media room or nursery are warm and cozy respites from the communal space below.